President Barack Obama, accompanied by, from left, Chicago Blackhawks head coach Joel Quennville, Blackhawks President and CEO John McDonough and Chairman Rocky Wirtz, holds up a team sweater as he poses for a group photo during a ceremony to honor the 2015 NHL Stanley Cup Champion Chicago Blackhawks, Thursday, Feb. 18, 2016, in the East Room of the White House in Washington. Going to the White House never gets old for the Chicago Blackhawks, even if their 2015 Stanley Cup came over eight months ago. And, it appears hosting the Hawks doesn&apos;t get old for President Barack Obama, as this was his hometown team’s third visit during his presidency. The team was greeted by loud cheers and camera-phone clicks as the president glided into a room filled with a few hundred fellow Blackhawks fans -- and the reigning Stanley Cup champs. The team and Blackhawks personnel stood on risers behind the president, with Lord Stanley’s cup in tow. The president joked about how the Blackhawks struggled to win a championship for almost fifty years -- and then, he became the Commander in Chief. As is the tradition, each member of the Blackhawks organization gets their day with the Stanley Cup. President Obama said he’d hoped he could have a day with, "the best championship trophy in sports.” Since that hadn’t happened yet, he suggested the cup remain at the White House for an upcoming state dinner with Canada, “we might just leave it in the middle of the room,” President Obama joked. It was one of many jokes told by Obama, now in the final year of his presidency. He congratulated Coach Joel Quenneville, who is now the second-winningest coach in NHL history. Obama then noted a feature Quenneville shares with other coaches who brought championships to Chicago, like the Bears’ Mike Ditka, the Bulls&apos; Phil Jackson and White Sox’s Ozzie Guillen: mustaches. 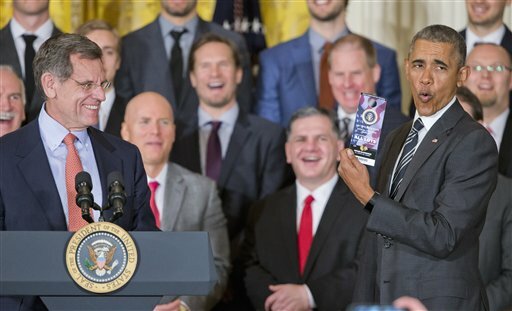 Since it was the Blackhawks third visit to the White House and old hat(trick) for some, the president focused the spotlight on two specific players: Retired 40-year-old defenseman Kimmo Timonen, who waited his whole career to win a championship, and finally fulfilled that dream when he was traded midseason to Chicago last year. The other player was picked for his humanity, backup goalie Scott Darling of northwest suburban Lemont. During a recent road game in Arizona, the goalie struck up a conversation with a homeless man, and offered a helping hand--he paid for the man to stay in a hotel for a month, and bought him food. The Uber driver who took the man to the hotel shared the story with an amateur hockey player, who posted it on social media. After the president finished with his remarks, team owner Rocky Wirtz and Vice President John McDonough handed him a few gifts. The usual ones, a jersey, a painting -- but two extras really excited Obama. He got his very own small replica of the Stanley Cup, and a season parking pass for all United Center games and events. The parking pass elicited the biggest response from Mr. Obama. "This is the best present I have ever gotten in the White House", Obama said. McDonough admitted afterwards that it was Wirtz&apos;s idea to give the president free parking. Since the president has never been to the Madhouse on Madison for a hockey game, they hope he’ll put it to use when he leaves the White House. There was only one piece of political speak made Thursday: The president said that the team’s Vice President of Scouting, Mike Kelley, offered to help him select a nominee for the Supreme Court. Kelley has had great success in his field, putting together the three-time championship team. The Blackhawks are headed to Minnesota to play an outdoor game on Sunday, this mid-week stop is never a negative, and it is a real eye opener for the new players standing on the stage hoping they will be there after this season with their names on the Stanley Cup.